Georg Bechter Licht is a small startup by an Austrian architect turned product designer. I’m giving them the unofficial Lucept award for “Superb Tiny Booth Design“. 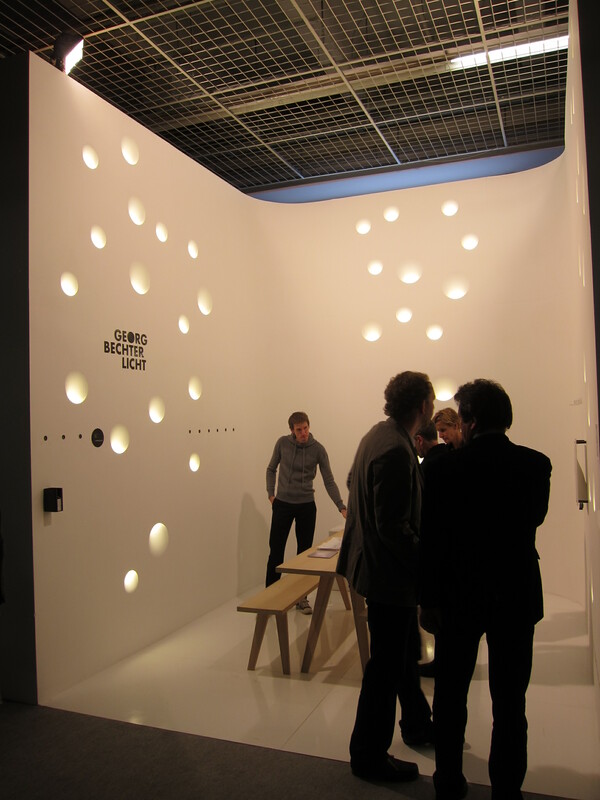 In a show like Light + Building, filled with massive booths and endless gorgeous presentations and product design, Georg’s booth was simple, elegant, and enticed passers-by to stop, look and linger. Bechter Licht’s first product is a porcelain-ceramic recessed fixture; a simple affair really, as if an old-fashioned porcelain socket got-busy with one of the many plaster-spackle recessed fixture designs. You can see one of the fixtures mounted to the wall in the right side of the picture. I suggested to them they really need to add a Zhaga standard socket and module instead of their Edison socket to complete the design.